Princeton University, Princeton, NJ 1966-1970 A.B. Medical College of Virginia, Richmond, VA 1970-1974 M.D. About Robert J. Pariser, M.D. 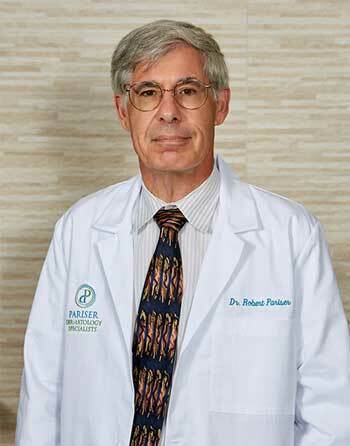 Dr. Robert Pariser is a Norfolk native, who after his education and training, returned home to join his brother, David, and his father, Harry, in the practice of general dermatology. He has been on the voluntary faculty of Eastern Virginia Medical School for his entire career and currently is a professor in the Department of Dermatology. His practice emphasizes cost-effective and evidence-based care of skin disease. He is commonly accompanied by medical students and/or dermatology residents. "I am very grateful to have Dr. Robert Pariser as my dermatologist. He is the most knowledgeable and perceptive Skin Doctor I have ever had in my 86 years of life. Thank you Dr. R. Pariser!" "I have been a patient of Dr. Robert Pariser for many years. I am so appreciative that he found the melanoma when it was extremely small. I continue to see him on a regular basis for skin cancer checks. Lisa has also been a wonderful person to work with. Everyone is compassionate and they take the time to focus on my needs and concerns. You all are wonderful!" "… I would highly recommend Dr. Robert Pariser to anyone requiring dermatological services. Keep up the great work."